Monash University has a long history of launching companies that turn research into real world impact. For many Masters and PhD research students at Monash, the pathway from journals and papers to launching a startup may seem out of reach. 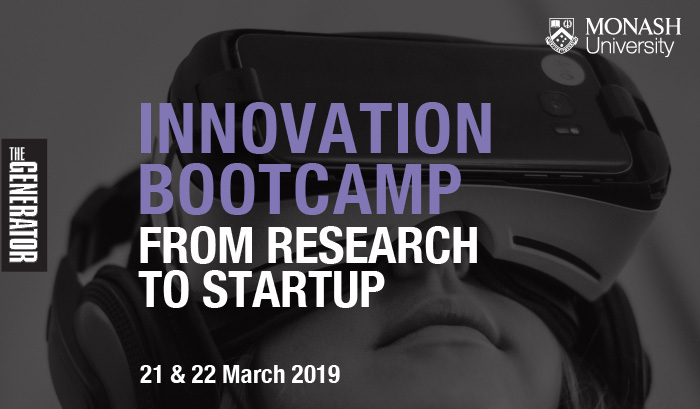 The Innovation Bootcamp, a two-day deep-dive into how to commercialise research, is here to help you realise your entrepreneurial potential. Over two days, a series of experts in research innovation will guide you through tools and resources to explore commercial potential and navigate the pathway to launching a startup as a researcher. The Big Picture: Gain an insight into what commercialisation is, how to know if you’ve stumbled upon a potential idea and how to proceed to make it a reality. Knowledge from industry experts: Learn the fundamentals when trying to build and launch a product from experts and people who have actually done it. This Innovation Bootcamp is delivered in partnership between The Generator, Monash University’s central startup hub, and Monash Innovation who manage IP, commercialisation and tech transfer at Monash. Over the two-days, you will learn from industry experts including CEO’s from research-intensive startups, entrepreneurs, patent attorneys, investors and leaders in the Melbourne startup ecosystem. This Bootcamp is for current PhD and Masters by Research students at Monash who are driven to change the world, and want to explore the entrepreneurial avenue to doing this. Spaces are strictly limited and are confirmed by an application and selection process. This is a highly anticipated offering exclusive to research students at Monash. Applications close Sunday 3rd March. Apply via the “Apply Now” link below.